· FOR BEGINS AND EXPERTS - The dynamic and intuitive control has a 6-Axis Flight Control System with Adjustable Giroscope Sensitivity and provides easy control no matter what skill level you have. · ALtitude MAINTENANCE - The drone stays at a constant height above the ground and stabilizes in place, so you can focus on pitch, yaw and warpage control to dominate them. · EXCUTY ACCTS - The drone can do pirouettes and flips through the sky gracefully and effortlessly to accurately master even the most advanced tricks. · LED LIGHTS - Drone with bright lights that complement the orange exterior paint to make it as visible as possible, even in night flights and for flight distances of up to 50 meters. · Do you want to give yourself or a friend the opportunity to make an extreme precision flight? PRESITTING THE - - - Drone Nano 2 SKEYE - - - MAINTENANCE OF ALtitude With this technology, the drone is placed at a constant height above the ground, allowing you to show your skills and tricks instantly. With the stabilized drone, you can focus on controlling pitch, yaw and warpage for precise mastery. 6-axis gyroscopeWith a 6-axis Flight Control System, the Nano 2 SKEYE is easy to fly, giving you more control than a standard 4-axis drone. The Adjustable Sensitivity of the Gyroscope provides a stable flight, while its acrobatic ability allows you to spin through the air with full, professional and accurate control.READY TO USE Charge your drone with the included USB cable and get it to fly for 30 minutes.Launch TO fly The Nano 2 SKEYE Drone can literally jump to the air from your hand. It´s so easy to use, you´ll blow it up like a pro in no time. 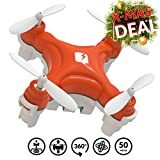 Drone with bright LED lights that complement the outdoor orange paint to make it as visible as possible, even on night flights and for flight distances up to 250 feet.Small and bright only 1.57 wide and 9 high and weighs 42 ounces. This compact and lightweight design allows the drone to fly through the air accurately. To get started, press the take-off button and use the included remote to perfect any movement.Since the SKEYE quadcopter uses a direct controller, rather than an app, it can fly much more accurately than larger and expensive models.TAKE THE AIR! With quality construction, stylish controls and a 1 YEAR, the drone Nano 2 SKEYE is yours today! Click the Buy Button and Order Now at the best price for you and your family!